Single loop galvanized steel cable grip supports up to 110 lbs and accepts cable diameters 0.3 to 0.43” diameter. Overall length of 12” with 4.5” of mesh. 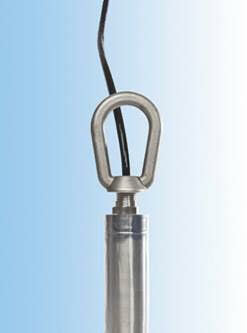 Use this stainless steel lifting eye to take the strain off submersible transmitter cables. Simply attach it to any transmitter with a 1/2″ conduit fitting and connect it to a wire or chain hook for increased support.